Saffron is a spice derived from the flower of Crocus sativus, commonly known as the saffron crocus. Crocus is a genus in the family Iridaceae. Each saffron crocus grows to 20–30 cm (8–12 in) and bears up to four flowers, each with three vivid crimsonstigmas, which are each the distal end of a carpel. Perfect for adding colour and flavour to your dhaal. 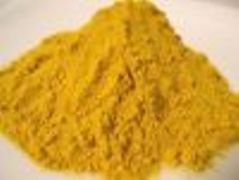 Can also be used to colour foods like 'yellow rice', and as a substitute for 'annatto' (which gives a golden yellow colour). Click the button below to add the Chief Saffron / Turmeric Powder to your wish list.